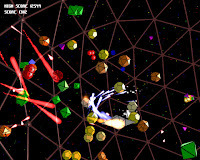 Claustrosphere is a 3D action game which takes place inside an enclosed area, putting you in control of a ship and surrounded by continuously spawning enemies from all sides. Basic flight controls are mapped to the W, A, S and D keys, while barrel rolls are executed by holding the Q and E key. The World Sphere indicates your current condition. When the ship is damaged, this is reflected by the sphere as well. The game ends when the World Sphere collapses. Collect white rings to make the sphere grow, or yellow ones to upgrade your weapon. The smaller sphere in the middle of the arena can be used as a reference to how the World Sphere's current condition. This sphere will glow red if the World Sphere is shrinking, or exude a blue glow is the area is expanding. Collision with this sphere should be avoided, since damage to it causes the arena to shrink. Scoring is based on survival time and the size of the sphere. Enemies with more sides are harder to destroy, but will fade to white as they are damaged by your shots.